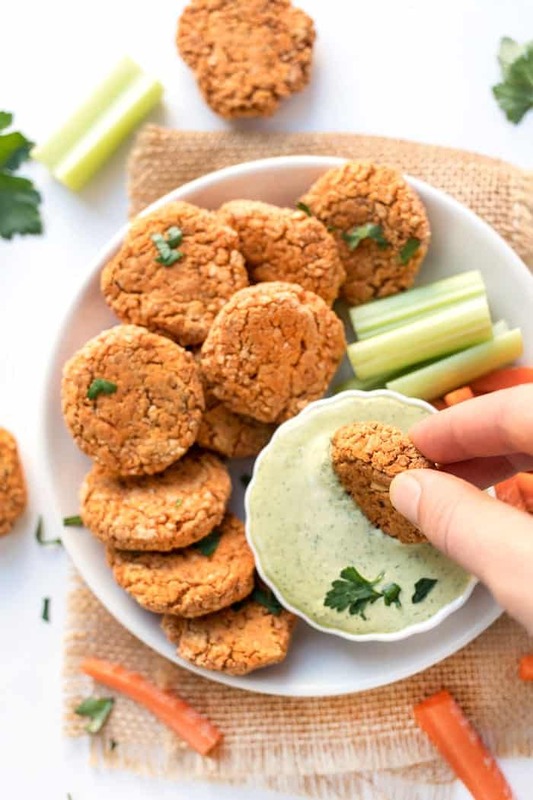 These simple vegan buffalo quinoa bites are a quick and healthy appetizer or snack, and are perfect for parties! Served with a creamy ranch dipping too! How many times have been out to eat with friends, they order the buffalo wings and you drift off into a daydream where you're eating something deliciously buffalo-y yet also plant-based? Probably at least 100 for me! For me, that wing-lover in my life is Matt. He's a meat-eater, which I'm totally okay with, and definitely loves his wings. While I've never personally been a fan of chicken wings (even before I was plant-based), I do love a good buffalo sauce and the smell is so addicting! For all my buffalo flavor lovers out there, I've got you. 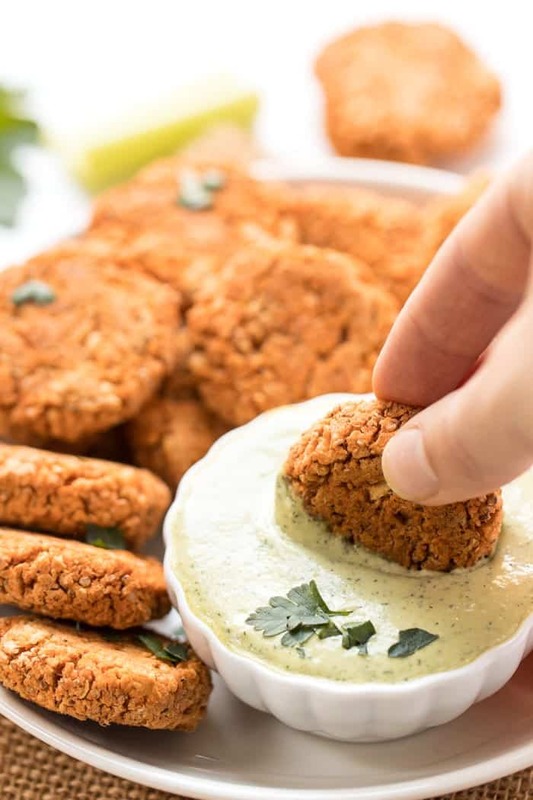 Today we're making Vegan Buffalo Quinoa Bites and serving them with a creamy ranch dressing and they are everything. Simple. Healthy. Flavorful. Protein-Packed. And freaking delicious! The great thing about this recipe? 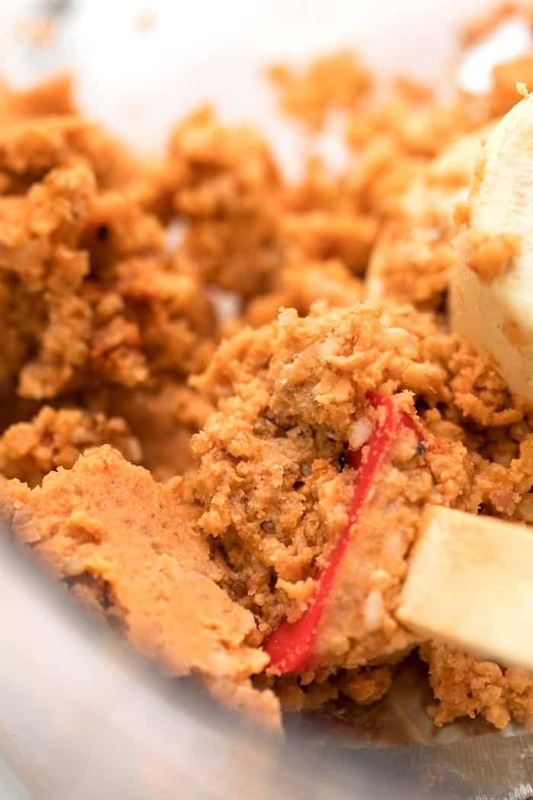 It's made entirely in the food processor! The base is white beans, which are creamy and relatively mild in flavor, which makes them the perfect vehicle for the buffalo sauce. We're also adding in some quinoa (of course!) to help hold everything together and add in some extra protein. Our spices are simple: just buffalo sauce, salt and pepper. Because honestly, that's all these quinoa bites need! Once we blend it all up, you shape them into patties or balls! If you're serving these at a party, I suggest thinking about the look you're going for and the audience that you're serving them to. Got kids at the party? I like patties because they remind me of chicken nuggets. Something a little more “sophisticated”, I'd probably go with balls because they resemble mini meatballs. 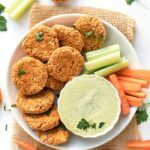 Let's talk about this vegan ranch dressing! I should preface by saying it's not a true ranch dressing, a bit more on the herbaceous side, but it's absolutely scrumptious! I actually used my vegan caesar dressing for inspiration, so we've got tahini and hemp seeds as our base, then swapped out the spices to give it a more ranch-like flavor. Our spices? Fresh chives, onion powder, garlic powder, dried dill and lemon. The chives are what's giving it that light green color, and while not traditional, promise you'll love it! I also like saving some extras, or making a double batch, and keeping the leftovers for salads or bowls. They're a great source of protein and add a really nice pop of flavor. They remind me of falafels, just buffalo flavored! Can't wait to see your recreations, friends! Make sure to tag me on Instagram with your own quinoa bites ❤ you can use @simplyquinoa or #simplyquinoa! Preheat oven to 350ºF. Spray a baking sheet with cooking spray and set aside. Add half the beans, shallot and garlic into a food processor and pulse until mixture is coming together, 10 – 15 pulses.Add the buffalo sauce and spices and process again until smooth. Pulse in the remaining beans, the quinoa, and chickpea flour until just combined. Remove lid and stir together to form a dough. 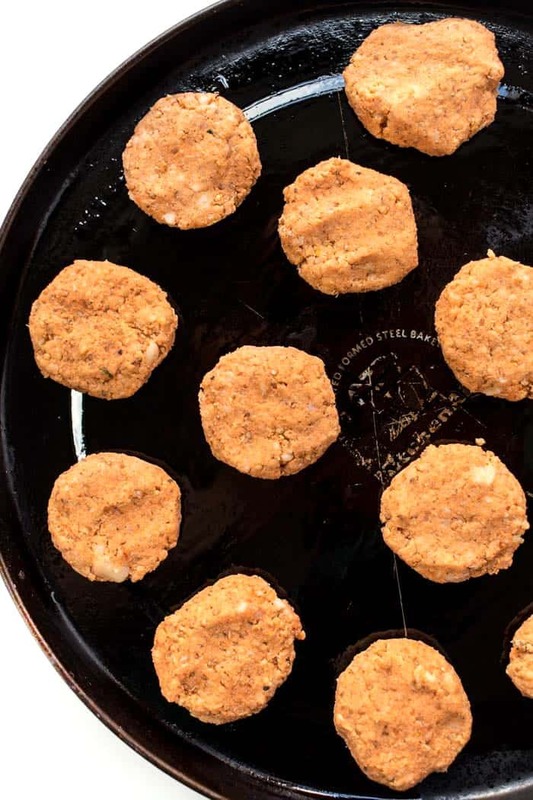 Shape dough into golf ball-sized patties and place on baking sheet. Repeat until no dough remains. Bake on center rack for 30 minutes, flipping halfway through until the bites are browned and crispy on the outside. Remove and let sit for 5 – 10 minutes. While the bites are resting, prepare the dressing. Add all the ingredients to a high-powered blender and blend on high until smooth. Taste and adjust seasonings as desired. 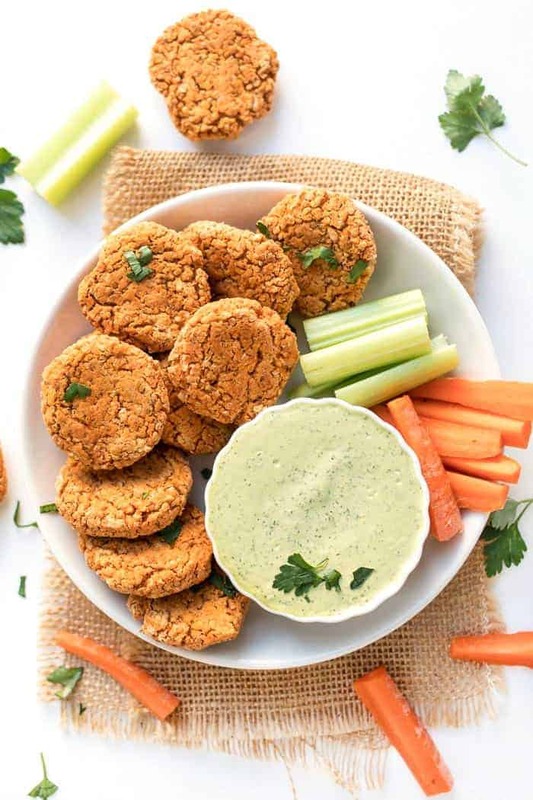 Arrange the bites around a bowl of the ranch dip on a serving plate (along with some carrots and celery if desired) and enjoy! Can I use black beans instead of white? I assume it will change the color but would it still work with the recipe? what flour can you use in place of chick pea flour? Almond flour? I would use another grain-based flour vs. a nut flour since they’ll have a similar absorption! I’m so glad you’re finding stuff here!! Could this be made in a Vita Mix? I don’t have a food processor. They look awesome! I haven’t tried, but I think it probably could be! You’d want to do the base part first (blending) and then transfer to a bowl and stir everything else in! trying to find out if this could be made a day or two then cooked later? Yep, definitely! Just freeze (or refrigerate) the bites and refrigerate the dip! Could I use chickpeas instead of Cannelini beans? I only have chickpeas. can they be made about 2 days ahead and cooked just before serving? Yum! I think I’ll make these and serve them as burgers/sliders!